If I am the state’s largest electric utility I have to be hoping that the limited natural gas pipeline infrastructure that supplies the New England market never gets expanded, that shale gas production has even more environmental impacts than it appears to now, or preferably both. I’ve written probably too many times about the electric power industry (as well as the commercial and industrial sectors) switching to natural gas (primarily at the expense of coal but also oil) because of its lower carbon intensity and significant decline in price over the past decade. Increased demand for natural gas along with New England’s limited pipeline infrastructure have caused natural gas prices to rise in New England more than in most other parts of the country but I don’t think that is reason to “jump ship” from natural gas. Natural gas production is increasing and it will likely be sometime early in the next decade before the increase in demand for natural gas in this country outstrips growth in supply (even though it feels like it in New England because of our pipeline limits). Coal is cheaper and becoming cheaper still for good reason, the demand for coal as a fuel for electricity production is declining rapidly and despite being a lower cost fuel, that doesn’t mean facilities that burn coal can sell electricity more cheaply than can producers using more expensive fuel. I briefly noted how electric power gets sold into regional markets in an early post. The Cliff Notes version of that is this: The suppliers of electricity (generating companies) in a region offer to supply electricity to the market at a given price and the offers are accepted beginning with the lowest cost providers first, until enough energy is supplied to meet expected demand in the region. The price of electricity offered by the last electricity generator needed to meet the regional demand determines the market price paid by companies that supply the electricity to businesses and consumers. So here is the rock (black) – our state’s largest utility has a large generating facility that burns cheap coal but because it costs a lot to burn coal in a way that doesn’t make NH look like Beijing on a bad day, the price of that electricity is high relative to other electricity producers in the region who are also offering their electricity in the regional market (primarily natural gas generators). The electricity generated by the coal burning facility has increasingly not been sold into the regional market. 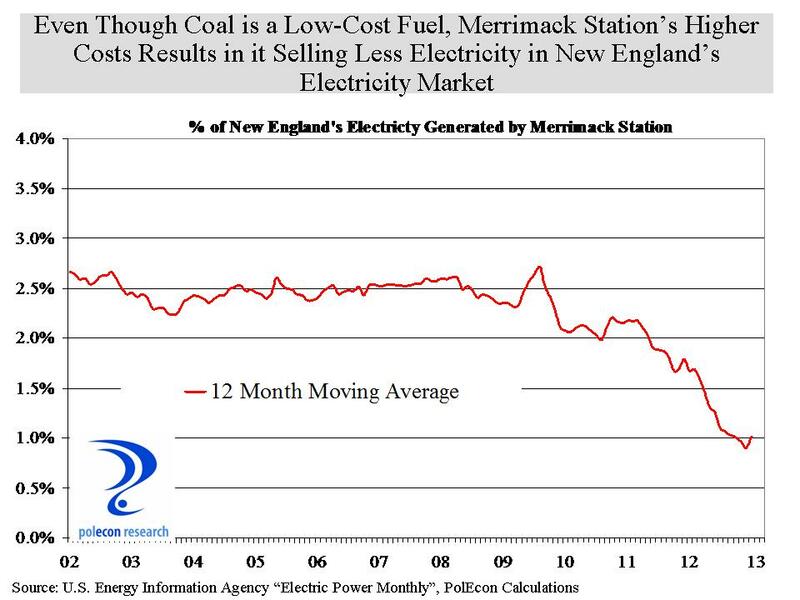 As the graph below shows, the longer-term trend indicates that the percentage of New England’s electricity that is generated by Merrimack Station has been cut by more than half. It is a 12 month moving average to smooth the results and prevent readers from getting nauseous from bouncing lines, but the trend is clear and troubling if you are a generator with a coal-burning facility. The “hard place” is the growing loss of its residential customer base as retail competition finally takes hold. A lot was made of the financial difficulties of one competitive supplier to NH’s residential market and the resulting return of its customers to the default service provider, but anyone who thinks that is going to stop the train from leaving the station is going to find themselves looking for another way to get to their destination. When your generating business is weakening and your retail business is declining, all that is really left for growth is your transmission business. This entry was posted on March 19, 2013 at 12:38 pm and is filed under Electricity, Electricity Generation, Natural Gas. You can subscribe via RSS 2.0 feed to this post's comments. Brian, I’m sure these trends were projected by PSNH several years ago…ergo the pursuit of the Northern Pass transmission lines and related business. No doubt, but isn’t it perhaps more troubling that with that foresight their hand couldn’t have been played more smoothly? Desperation never looks good.